"As the summer of 2004 fades out over California, former star quarterback Gibson Goode announces plans to dump his Dogpile music megastore on Oakland's famous Telegraph Avenue. Nat Jaffe and Archy Stallings can only fear the worst for Brokeland Records, their vulnerable vinyl emporium. But while trying to save their livelihood they must contend with the sudden arrival of Archy's illegitimate teenage son Titus and the return of his father, Luther, as well as the rupture of their wives' midwifery service." 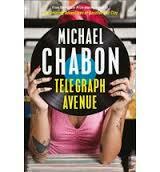 There is something about Michael Chabon's writing that makes him special, different. Right away, you can feel the energy in his writing. He has a keen eye for observation that allows him to draw simple connections between things that had previously seemed superfluous to one another. As the Guardian put it, he "walks the line between high and low culture." He straddles it, in fact, and occasionally thrusts a little. The novel is structured into five parts, almost like a Shakespearean play, although it was pointed out to me that perhaps it was supposed to mirror the structure of a record. I can't comment on this but if someone could comment and let me know, that would be great. I saw the five parts as being like the five key movements in the story, from the inciting incident, in which everyone manages to find themselves in trouble, through to the finale in which death, and birth, bring everyone together. In a way, the novel is cyclical; while everything changes, everything stays exactly the same, and Archy ends the novel the way he began it- Holding a baby. You should read this novel if you love American pop culture, characters who stick with you, vivid colours, sounds and smells, and language so rich you want to roll around in it a little. I found it a slow read though, probably because it's intensely character driven. The entire plot only takes place over a matter of a handful of days. Be prepared to spend a lot of time inside the warped minds of particular characters.